South Street was overflowing May 5 for Cinco de Mayo, but the Theater of Living Arts was packed for a different– and decidedly British – occasion. With instruments tuned, bottles of water and Corona scattered around the stage and a red Solo cup of tea placed by the center microphone, the stage was ready for Oxford band Foals to start their performance. Foals was listed as a co-headliner along with urban indie pop group Freelance Whales, but the majority of the crowd stayed for Foals – and the audience’s passion made it evident that the English group was the reason the show sold out. Freelance Whales fans were definitely present, but many left after their set, making Foals feel more like a single headliner. The room was buzzing with anticipation for their start. Fans were singing some of their songs before they even came out, and there were more than a few fake English accents overheard. Lead vocalist and guitarist Yannis Philippakis, who used to be in the math rock band The Edmund Fitzgerald with drummer Jack Bevan before joining Foals, wasted no time in gaining the affection of the Philadelphian crowd by complimenting the city and also mentioning that he enjoys those “steak things” we eat. Other than this early “hello” and some “thank you”s, the band did not talk very much and kept their often hypnotic music flowing. 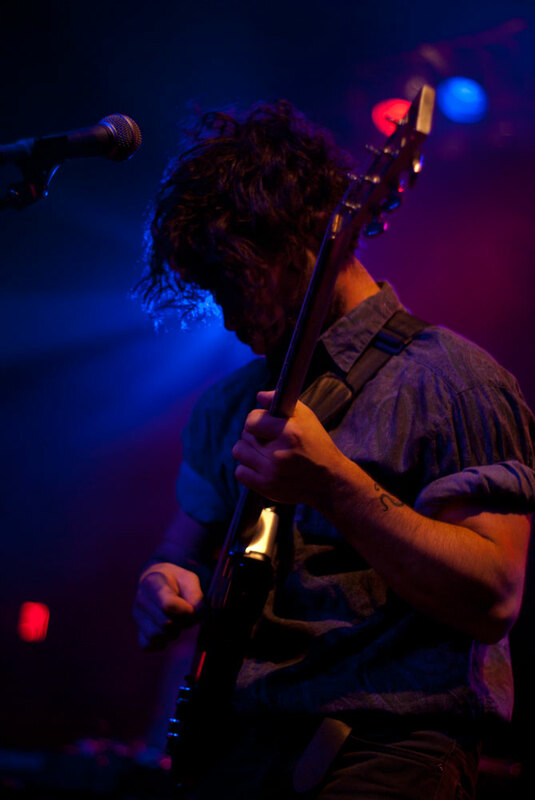 Foals have been attributed to multiple genres, such as indie rock, dance-punk, post-punk and math rock. Individual songs could be slotted into different categories, but their music as a whole is difficult to narrow down. Their first album, “Antidotes,” is marked by up-tempo, easy to dance to songs while their latest release, “Total Life Forever,” is a bit more melodic. However, all the albums work incredibly well together. The band was able to balance the somber songs with the energetic ones, pulling the audience in with extraordinary instrumentals, hyped up with fast guitars and heavy rhythms. Played live, their songs are given new life and seem even more impressive as one watches each musician concentrate on their instrument. Philippakis’ vocals and lyrics are also striking. Often, the vocals act as another instrument, their sound outweighing their meaning, especially when the lyrics loop. However, this does not mean the lyrics are nonsense. While songs on “Antidotes” are often hard to decipher, Philippakis stated that he tried to be more direct with lyrics on “Total Life Forever.” They still are not simple, and it is difficult to figure out exactly what he meant for many tracks, but there is definitely room for one to grasp his or her own interpretation. Those lyrics were sung along to by an enthusiastic crowd, off their feet multiple times during the set. The bands’ encore consisted of rhythmic numbers from “Antidotes” that ended the night with a burst of energy. The English band is one that must be seen live if you enjoy their albums. It highlights the importance of every instrument; not one stands out or fades into the background. There is a contrast between the band’s serious demeanor and the lighthearted dancing around the stage that creates an entrancing yet fun atmosphere. Foals is in the early stages of demoing, and with a growing fanbase, future tours on this side of the pond are expected to be even bigger and hopefully just as, if not more, energy packed.